What Is Google AdWords? Is It Right For Your Trades Business? Trades Business Tip: What Is Google AdWords? Should You Be Doing It? Click on the video to watch it (Runtime 8 minutes). Click here to book a 10-minute chat with Jon. If you’d rather read the transcript it’s here below. Google Adwords or Pay-Per-Click Advertising. We’re going to ignore Bing (I don’t really care about Bing). I was inspired to write this because I saw a thread on the Builders Talk Group on Facebook where someone was asking so here you go. I’m going to try and help you navigate through this. It’s called that because you pay every time somebody clicks your ad. You put an ad and you get to decide when your ad shows based on the words that people type in the search box. 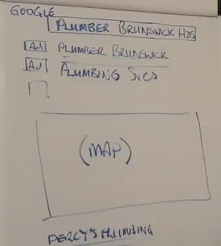 Someone might type ‘plumber Brunswick Heads’ and you can have your ad show up there when someone types that. And if they click on your ad, you’ll pay the money. Now, it can be complicated. You can waste money easily and you can misdirect your funds so I don’t propose that you do this yourself. I’m Jon from Small Fish Business Coaching. I help my customers decide how to invest their marketing money to get the best return. Investing in Google AdWords isn’t always the best choice. Certainly, I don’t recommend a DIY approach, just like you probably don’t recommend a DIY approach for building a house or doing a qualified tradesman job. I recommend that you engage an AdWords specialist to do this for you. We direct a strategic campaign, not just shooting from the hip. They know which trade they need – so their need comes and they know which trade they need to fix their problem. And that’s the thing. You don’t know what they’re going to choose. They have a need and they know which trade they want. They search on their phone, usually on their computer in Google, the trade name and the location name comes up on the search page, which I’ve drawn out for you on my high tech flip chart. I’ll explain that in a moment. They choose one and click on it based on what’s written on that search page and they either click on the ad and go to your website or your landing page. Or they click straight to call and make a call. There’s a number of things going on. Once they get to your landing page, they decide whether to call you or enquire on your website of course. It’s a bit complicated. Someone with a need searched something. There’s what we call the organic listings below. I’ll explain what each one is. Ads are the ones people have paid for, usually there are 3 or 4. Google says that 70% of the clicks with commercial intent add up on an ad, which makes sense. What that means is more people who want to buy something will click on an ad, which makes sense because if there’s an ad there, you know that they’re selling the thing. And usually their ad copy, the writing, tells you that they’re selling the thing, so you know you’re in the right place. If you’re wanting to buy something, I think that’s a good place for trades. If you’re wanting to buy a trade service and there’s an ad that says we do this, you’re likely to get a click. Having said that, there’s a map that shows people close by in the ads because you can pay to serve your ad. They might not be close by, so this is quite appealing for people as well. And then the organic listings is Google’s view of the most appropriate website for that searc phrase according to several hundred factors. I usually say to my customers, “You want to be in all three. You want to be here and on the map and high up there. You’ve got three listings on page one. You’re more likely to get a click and you’re more likely to look credible that way.” Of course, it costs money and time and not everybody is in a position to make that level of investment. Let me talk to you about Google AdWords. It’s instant. You can get your ad there. Google lets everyone take a turn on who gets to be at the top of that page so your ads are getting shown. Your money is getting spent. Your daily budget is going to get spent so you’re going to get clicks from people who searched. If you write the ad properly and you choose your search words carefully, you don’t waste that money. You get people who really are interested in what you’re selling. I’ll go through them briefly. The bigger area you try and cover, the bigger the competition and the more you’ll pay for your click. And the more specific you are, the less you’ll pay for you click. I think that people are increasingly typing their suburb, but not London. If I’m in London, in Northland, I don’t want to Google ‘plumber London’ and get somebody from South London who’s going to not want to come. I want somebody close at hand. And people have woken up to this now and aren’t typing Sydney, or big city names anymore. They’re typing suburbs and location specifiers near home, more specific ones, so think like that. Think of all the names for your trade. All those plus names for similar stuff. You don’t know what they’re going to search. You have to try and guess, and you have to try and cover all the bases. Now, think about the ads. You have to write an ad. They see a nice ad with some words that say, ‘Cabinet maker North Sydney, guaranteed fixed price quote, free quote’ whatever. And you’ve got to write something there that attracts people to click on the ad. Some of them you can call directly from the ad, so you want to entice people to make the call. Tell them something nice about yourself and give them something that entices them. The last thing is where they land. If they just land on your home page, that’s one thing. If you have a landing page, a separate page on your website that’s consistent with what you said in the ad, you get more clicks for your money, so that’s a good thing too. I’m running a workshop where I’ll spend half an hour on this, not four minutes. And when I’m coaching people, I’ve got training videos that last for an hour each. There are 2 or 3 on this so there’s more to it than I can get across in a short video. I hope this helps. If you can make it to my workshop, it’s over here in Australia in Byron Bay. It’s $300 and there’s a link on the screen there for you to click or to copy and paste into your browser if you want to learn more. Jon likes helping business owners and especially owners of trades businesses. Life can be a bit frustrating when you run a business and a trade business can be even more so. Jon reckons this stuff is fixable and that you can fix it by making some fairly simple changes to the way you do things. In fact, he runs a free monthly webinar to help explain the process further of moving your business from manual to scalable. Subscribe for weekly Toolbox Tip videos on how to grow and scale your trades business. Workshop in Byron - I made it for tradies but why not apply it to your business? Tradies - Who Is Your Target Market?